Preserving the diversity of species and protecting land and soil are prerequisites for safeguarding our necessities of life. The fishing and tourism industries are just two examples of where we are highly dependent on properly functioning ecosystems. Biodiversity – be it in the air, water or the soil we cultivate – must be encouraged. Overuse of these natural systems needs to be prevented, just as much as their contamination with pollutants and waste material. Utilisation for the production of renewable resources must be accomplished on a sustainable basis. Human influence on natural habitats of species leads to declining populations of animal and plant species, as well as soil erosion around the world. Companies operating in food production will face increasing challenges as a result. The graph shows the evolution of WWF‘s global living planet index (LPI) in the past 40 years. The index measures trends in thousands of different vertebrate species, meaning that species such as insects or microorganisms are not included. It also doesn‘t cover plant species’ populations. As is visible above, the overall trend of vertebrate species population size evolution is clearly negative. On average, populations of vertebrates on land, in freshwater and in seawater have diminished to about half the size they were 40 years ago. 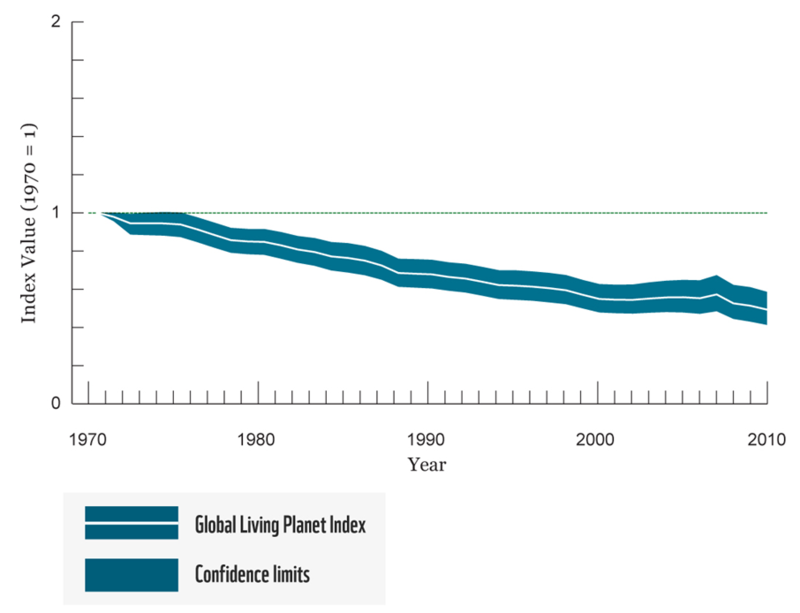 The Global Living Planet Index (LPI) shows a decline of 52% between 1970 and 2010. Freshwater vertebrate populations have declined by 76% in the same timeframe. Human beings, like any other species native to this planet, have always depended on nature to provide resources essential to survival. Mankind is currently testing all the limits of ecosystem resilience. Once certain limits are breached, individual ecosystems can collapse with no hope for recovery, causing eternal losses in ecosystem services. In a 2012 study by Groot et al. it is found that the monetary value of ecosystem services by a single „average“ hectare of ocean is close to 500 USD per year, while one hectare of coral reef contributes more than 300,000 USD in ecosystem services. The surface of the earth consists of roughly 11.3 billion hectares, 70% of which covered by oceans. Investment-Relevance: Agriculture, Food or Tourism? Loss of biodiversity and land has financial implications. The destruction of coral reefs can have serious consequences for the tourism industry and companies active in such fields. The same is true for declining agricultural yields due to excessive fertilization and erosion of fertile soils. Crop production per hectare is projected to decline in the future, while water intensity of crop irrigation will increase. Sustainable practises in land use and crop production will pay off in the long run. Food manufacturers that rely on such practises will increase their competitive advantage. Through their size, the largest companies have the power to change market practises. Cod stocks in the North Sea plummeted by 87% compared to 1880. Brazil lost over 58 Million hectares of forest between 1990 and 2010. 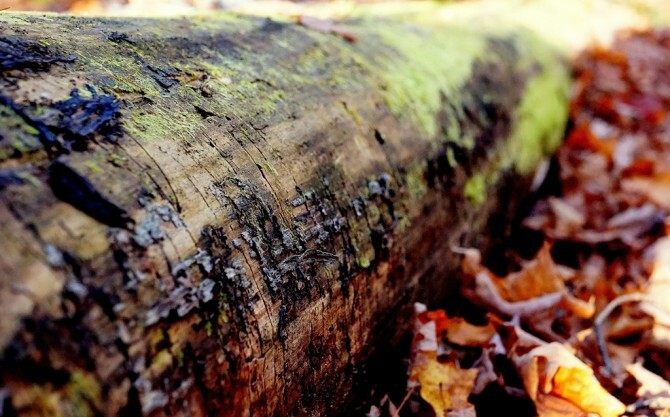 53% of global paper production is recycled as of 2012 in an effort to combat deforestation. The World Wildlife Fund (WWF) has had a pioneering role in both information of the public and taking action against the destruction of natural resources. In addition to sources from academia, news publications and UNEP datasets, Globalance Bank uses the goals and recommendations by WWF in assessing a company‘s impact on preservation of biodiversity and land.